The Semiconductor Index made a support test at converged 200-day MA and horizontal support of 1,295. Technicals for the Semiconductor Index have a bearish MACD trigger 'sell', CCI and ADX bearish cross in the +DI/-DI. 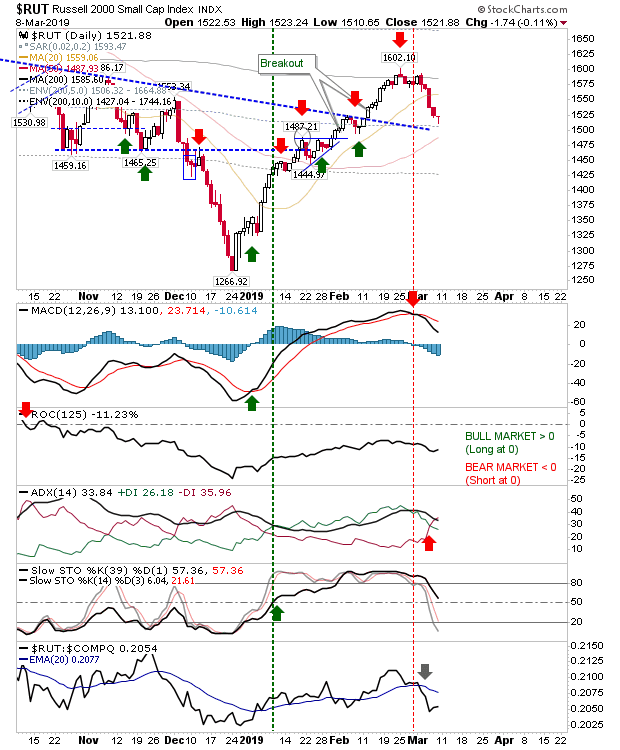 Intermediate-term stochastics [14,3] are oversold and in a position to mark a new 'buy' trigger. 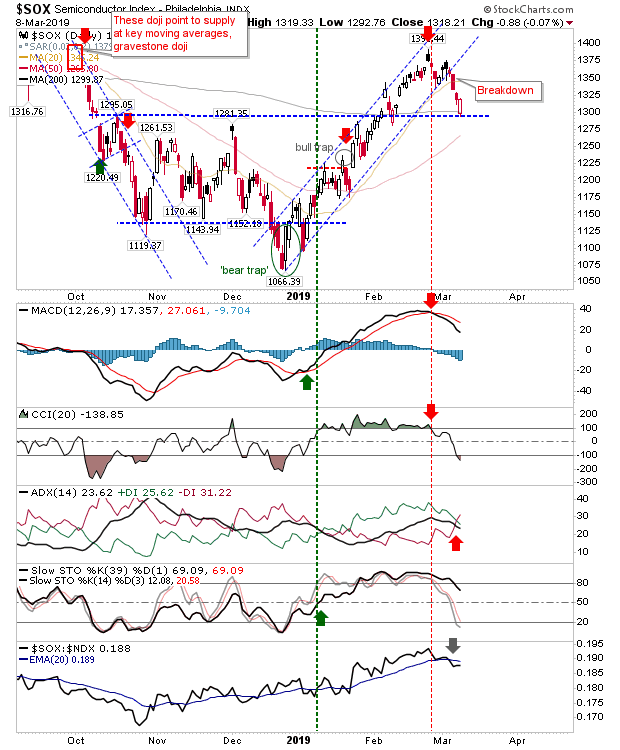 For other indices, things were looking a little more bearish. 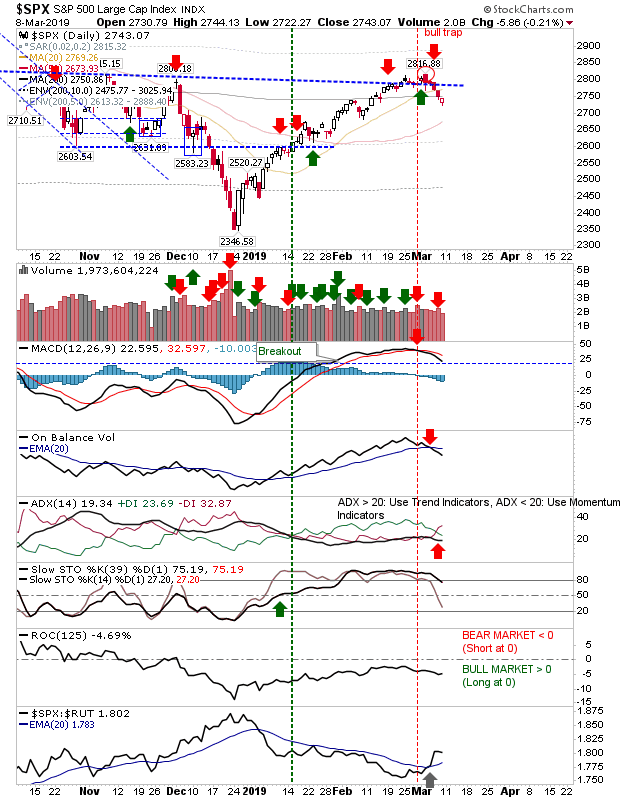 The S&P undercut its 200-day MA without putting up a strong defense, although it did manage to recover enough to suggest a secondary defense could be made on Monday. MACD, On-Balance-Volume and +DI/-DI are all showing bearish 'signals', but relative performance is firmly in bulls favor. The Nasdaq had already kissed good-bye to its 200-day (and converged 20-day) MA. Next, it will be looking at the 50-day MA for support. Technicals are showing 'sell' triggers for MACD, On-Balance-Volume and +DI/-DI. While relative performance (vs the S&P) is steadily rising it too is looking at a possible 'sell' trigger. The Russell 2000 flashed a doji at declining support - which is just above a rising 50-day MA. 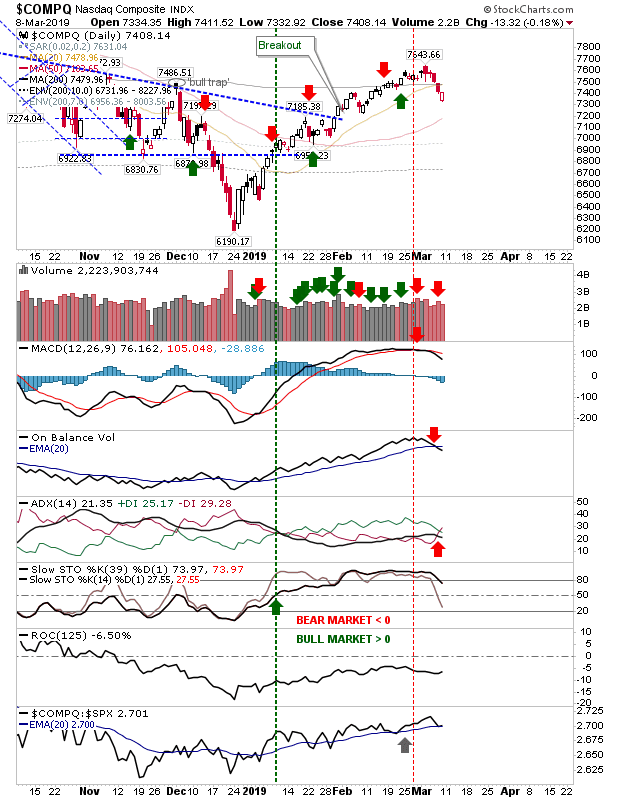 Technicals aren't great but there is the possibility for Stochastics at oversold levels generating a 'buy ' trigger often a test of declining support (former resistance). For tomorrow, look for a kickstart rally in the Semiconductor Index off support. Other indices have merits in this regard but lack the clear support levels which could jump-start a rally. Declan Fallon runs a market commentary blog at Markets.fallondpicks.com, and is a contributor to TalkMarkets and Seeking Alpha. He previously contributed to the Motley Fool. Declan Fallon is also a UI/UX Dashboard Designer for First Derivatives/Kx Systems.